Please watch this video for an overview of how service dogs can assist veterans and first responders with disabilities, then continue reading below. Seek help for his partner in emergencies. How do I know if a Hero Dog is right for me? A Hero Dog thrives and gives his all when a strong bond develops between the dog and his human partner. To earn the dog’s loyalty and respect, and to foster a healthy relationship, you and the dog will need to work, play, and spend many hours training together. You must be as committed to the dog as the dog is to you. In short, you must have the physical drive and emotional stamina, as well as the right environmental conditions and life circumstances, to make the dog a major priority in your life. If you haven’t yet stabilized after your injury, or if you are still in treatment that demands most of your time and energy, or if your work situation or home environment are in flux, this is not the right time to consider applying for a Hero Dog. However, if you think you are ready to make the commitment, you have the full support of everyone in your household and that of your caregivers, you are motivated to do the training, and you are excited about the prospect of gaining a devoted companion who can help you achieve greater independence and dramatically improve the quality of your life, please continue reading to learn more. Can a Hero Dog be trained to assist a veteran or first responder with PTSD or other mental health conditions? It is possible that a Hero Dog can help you if there are specific ways in which a dog could be trained to perform actions that mitigate your disability. For example, if you become disoriented in a crowded room, the dog could be trained to lead you to an exit. If you have nightmares, the dog could be trained to wake you by turning on the lights or music in the room. Dogs can be trained to interrupt compulsive or stereotypic behaviors. Some dogs can be taught to recognize early signs of anxiety in their partners and to give an alert and thereby re-focus their partners, who can then use strategies they have been taught to cope with the situation. However, please be aware that a Hero Dog (or any service dog) is never trained to protect or defend its partner, and is expected to be friendly toward all people when in public. This is for your safety as well as that of the public. If you should need emergency medical assistance, rescue personnel must be able to approach and assist you without fear of your service dog interfering. You must be currently in therapy (i.e. counseling, as opposed to just medication checks) with a mental health practitioner. Either individual or group counseling is acceptable. You must have had at least eight (8) hours of therapy with that provider within the three (3) months prior to applying before the provider can fill out the Mental Health History and Report. If you are prescribed medications as a part of your mental health treatment and a different provider monitors your medications, that other provider must also fill out a Mental Health History and Report. 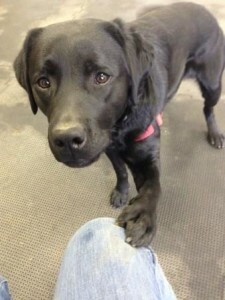 You must remain in counseling with a mental health practitioner for the duration of your training with Hero Dogs. Use of a service dog for PTSD (or other mental health condition) is an adjunctive therapy and does not replace the need for professional mental health treatment. We will not accept your application if these criteria are not met. What are the requirements of a potential candidate for participating in the Hero Dogs training program? Please read the information on our Applicants page carefully to determine if you are eligible to apply. Do I need to meet a minimum level (%) disability rating from the VA? No, Hero Dogs does not require you to meet any minimum % disability rating from the VA. As part of the application process, we do request medical history and evidence of disability from the applicant’s medical and mental health care providers; however these providers do not need to be part of the VA healthcare system. Since some Veterans may have acquired their disability after leaving the military, or may choose to use private medical care rather than the VA system, we do not require any minimum VA disability rating. If I don't need a minimum disability rating from the VA, why do you request a copy of my VA rating decision? If you do have a VA rating decision, the complete document (not just the cover letter stating the final result and % granted) has extremely valuable information about the history and origin of your condition(s), particularly for Veterans whose disability or medical condition was not acquired recently. In cases involving traumatic brain injury and psychiatric disabilities, the VA rating decision has important information about potential impairments to concentration, memory, and learning that Hero Dogs needs in order to tailor the training program to the Veteran’s abilities. Additionally, your VA rating decision may contain information about other medical conditions for which you are not receiving any compensation, but for which the assistance of a service dog could still be valuable. All of this information contained within the VA rating decision helps the Hero Dogs Application Committee see the larger picture of how a service dog could assist you. I have a dog already. Can you train him to be my service dog? No. The job of a service dog is not an easy one. It takes a very special dog to succeed; most do not. We raise and train only pre-screened 8-12 week old puppies who have been donated to or purchased by Hero Dogs. How do I apply for a Hero Dog? First, please read the information on our Applicants page carefully to determine if you are eligible to apply. Then follow the link on the bottom of that page to fill out an Eligibility Survey and request an application. How does Hero Dogs decide who is a candidate for the training program? whether you are willing and able to make the commitment to the training program. In addition, you must be capable of providing financial support for the dog after ownership has been signed over to you. Since each case is unique, there is no “recipe” for matching an applicant with a dog. Service dog partnership is exactly that – a partnership – a two-way relationship between person and dog. The success of the partnership is dependent on the needs, abilities, and personalities of both individuals. If I apply for a Hero Dog and am not accepted, can I re-apply? Yes. However, applicants must wait a minimum of 12 months after receiving a denial letter from Hero Dogs to re-apply. Are there any fees, costs, or obligations associated with applying for or training to receive a Hero Dog? There is no application fee and no charge to you for a Hero Dog or for any of the associated training. However, because you will need to forward certain medical and other records to us as part of our application process, you will be responsible for any copying or postage charges for such documents. You will also need to provide your own transportation to and from training and, as a result will be responsible for any costs associated with doing so. If you and a Hero Dog are eventually matched, successfully meet the training requirements, are certified by Hero Dogs, and graduate from the program, ownership of the dog will be transferred to you. At that point, you will then be responsible for all of the usual costs associated with owning a dog. Clients are not required to participate in any fundraising activities for Hero Dogs. In fact, we require that potential applicants refrain from volunteering, donating, or otherwise participating in fundraising or public relations activities for at least six months prior to applying. Once a team has completed their training commitment and certification, they are welcome (but never required) to volunteer for Hero Dogs. How long is the wait for a Hero Dog? Dogs are matched with Veterans based on the dog’s skills, strengths, temperament, and energy level, and the applicant’s needs, experience, personality, and lifestyle. There may be an indefinite wait for the right dog to become available for a particular applicant. What training does the dog receive? Training never stops, however. The ADA guarantees people with disabilities the right to be accompanied by a service dog in all places open to the public, but the dog must remain unobtrusive and behave impeccably. For instance, if the dog disrupts the course of business by barking or growling, a business owner has the right to ask the person to remove the service dog from the premises. Therefore, continuing to train with your dog on a regular basis to keep its obedience and public deportment skills polished is a necessity for a successful Hero Dog partnership. Opportunities for you to maintain your dog’s obedience and public deportment skills are available to you through follow-up training, access to group classes, and consultations with our staff, as long as you continue to qualify by participating in and passing your bi-annual certification. What training does the client receive? 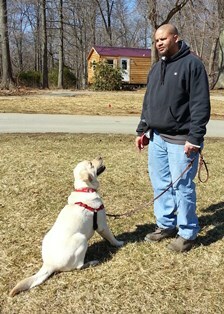 One of Hero Dogs’ most unique and important characteristics is the level of support and training we provide to clients matched with one of our service dogs. In turn, this means that clients accepted into our program and matched with a dog must commit to the requirements of the training program. The team trains together under the supervision of a Hero Dogs staff trainer for a minimum of 120 hours (over the course of at least 6 months) in a variety of public and private settings, including the client’s home, school or workplace, community, stores, public transportation, etc. The training program is customized to the individual client’s needs and abilities. At the completion of this period, the team must successfully pass a three-part certification examination. Please read more on our Team Training Program page. Besides training, what responsibilities are involved with being partnered with a Hero Dog? for the dog each day. If you are physically incapable of exercising the dog, you will need to make arrangements for someone else to do so. Letting the dog out in a yard does not constitute adequate exercise. Hero Dogs requires their clients to keep the dog leashed or supervised within a safely enclosed area at all times when outside. We do not permit electronic fencing and do not condone the use of dog parks for socialization or exercise. Keeping the dog well groomed is another requirement of partnership with a Hero Dog. If you cannot bathe and groom the dog yourself, you will need to determine where you will take it to be bathed and groomed and also consider the expense of such services. Regular veterinary care is essential. You will be expected to adhere to our recommended checkup and vaccination schedule to maintain your dog’s health. You will also be required to keep your dog current on monthly parasite prevention medications. A good quality food will be essential in maintaining a healthy weight for the dog (we will provide recommendations). Although your Hero Dog will be sent home with essential equipment such as a crate, collar and leash, vest and training equipment, toys, and so on, these supplies wear out with time and will need to be replaced. In all, you can expect to spend an average of $1,000 – $1,500 per year over a typical 10 to 12-year lifespan. This is a serious financial commitment which you should consider carefully before applying for a Hero Dog. It is also important to consider the commitment other family members will have to make to your Hero Dogs partnership. They may need to assist you in caring for your dog at times. They will always need to be supportive of your relationship with the dog, agree not to interfere with the dog’s training or the work it performs for you, adhere to rules and expectations regarding the dog’s behavior, and respect the bond between you and your Hero Dog. Who owns the Hero Dog? Hero Dogs, Inc. retains ownership of all dogs throughout their training period and for at least six months following certification. Transfer of ownership to you will not be considered until you and the dog have successfully met our training requirements, consistently followed rules and regulations concerning the dog’s care, safety, and behavior, and passed the certification examination. Once requirements are met and ownership is transferred to you, you are responsible for all of the usual costs associated with owning a dog. Is registration or certification of service dogs required by law? Registration or certification of a service dog may be offered by a service dog training organization as a way of determining if the service dog teams they have trained are maintaining their obedience, public deportment, and specially trained skills. However, proof of either registration or certification cannot be legally required by a medical practitioner, place of business, or other public entity in order to permit a person with a disability access with his or her service dog. Registration or certification are currently not required by law. I have a service dog that I trained myself / was trained elsewhere. Will you certify him for me? No. We do not offer certification to dogs not provided and trained by Hero Dogs, Inc.
What if a Hero Dogs client needs help after certification? Is re-certification of a Hero Dogs team required? Re-certification of a team is not required, either by Hero Dogs or by law. However, if the Veteran wishes to keep the Hero Dogs vest and identification tags or cards, and have access to the support services provided by Hero Dogs, the team must re-take and pass the certification examination every two years. Even though the vest and ID tags or cards are not required by law, they do ease potential public access difficulties and give the Veteran/Hero Dog team a professional appearance. What happens when my service dog can no longer do his job? We hope that you and your Hero Dog will have a long and beautiful partnership, about ten years in most cases. However, sometimes an injury or illness can result in a dog’s inability to do his job, and all dogs will slow down with age. When your Hero Dog needs to retire, you have the option to keep him as a pet. You can still apply for a successor dog even if you keep your current service dog as a pet. Applicants approved for a successor Hero Dog have priority over first time candidates in being matched with a suitable partner. If you are unable to keep or care for your Hero Dog after he retires, you must return the dog to us. We will find the dog a happy retirement home. If you have a friend or family member who would like to adopt the dog upon retirement, we will consider them first but do not guarantee that they will be permitted to adopt the dog. Our first priority is making sure that the dog has a safe and loving home which can meet his needs in his golden years, including the likelihood of increased veterinary costs of an aging pet.